Congregational Church - Faringdon Community Website. The origin of the Congregational cause in Faringdon is to be traced back to about the year 1760 when a Lincolnshire builder, John Fidel, came to town to supervise the erection of Beckett House (Shrivenham). He so pleased Lord Barrington that he persuaded Fidel to stay and commence business as a builder. A Christian of Free Church persuasion, he felt a need of fellowship which the fortnightly services in the Baptists Capel did not meet. His workshop (Marlborough St, opposite the now Roman Catholic church) he fitted out for worship, and began to hold services. When supply preachers could not be found he led worship himself, and most acceptably. Local magistrates took action against him for holding services without a licence, but on Lord Barrington’s intervention the charges were dropped. In 1800 a small chapel on the opposite side of the street, built by Fidel, was opened, the work being maintained by a number of supply ministers. The Sunday School was begun in 1805 with paid teachers, and the Manse and garden were bought two years later for £500. So the stage was set for the first consistent ministry, begun by the Rev Daniel Holmes in 1810. 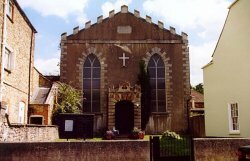 He ministered in Faringdon for 27 years, and succeeded in expanding the work into Fernham and Shellingford, where chapels were built. It was in 1840 that the present chapel was built, being an extension of existing premises, taking in the vestry on the West side and bringing out the front where the minister’s house formerly stood, and all at a cost of £740. The buildings were further improved in 1863 when the Chapel house which stood in front of the chapel was removed to make a spacious, open front. Sometime during the 1870’s the British schoolroom was purchased by the church, for £120. Its value in 1974 was set at £1600! The present organ was installed during the ministry of Rev JH Fry 1883 – 1889. In 1890 Jubilee Services were held, when the Senior Deacon, Mr Oliver Gerring, paid tribute to past ministers and deacons, by whose faithful work the cause had been maintained. What was said about those who came before was equally true of the many who came after. Each used the gifts God had given, some excelling at work among the children, others at outreach work. New causes had begun and chapels built in Fernham, Shellingford, and with the help of the County Association and the Home Missionary Society, at Stanford, Great Coxwell and Uffington. So the work continued in a quiet unassuming way. Children were taught the love of God, there elders were cared for, and shared in that caring for others. The church reacted to the needs of the day. During the last war it was used top provide canteen facilities for troops in the area, and the film shows were provided for troops and civilians in the surrounding villages. Out of such faithful work, God raised up many to serve as ministers of the Gospel, and many more to serve in humbler ways.